It is possible to get a helmet that covers your entire head and face, and in theory would protect you against more kinds of falls. In particular, Why don't bicyclists wear them, and why do motorcyclists wear them? Some bicyclists do wear full-face helmets; in particular, downhill mountain bikers and BMXers will frequently wear full-face helmets, as the chance of a crash causing you to land on your face is greater. The problem with full-face helmets is that they're hotter; your head is great for getting rid of excess heat, and the full-face helmet helps trap more of that in. Motorcyclists aren't pedaling furiously, and don't need to lose as much heat; heat management is essential for bicycling. Furthermore, motorcycle accidents tend to happen at higher speeds. On a bike, you're pretty unlikely to wipe out at 60 MPH, while on a motorcycle, it's all too possible. Between the lower risk on a bike, the heat issues, and the extra cost of full-face helmets, for most people it's not worth it to wear the full face helmet on their bicycle. Any safety feature is a trade-off, between the costs of implementing the feature and the harm or damage that it prevents. When the cost of implementing the feature exceed the expected value of the feature in harm reduction (taking into account the likelihood of the particular form of accident happening, and how severe the damage is), then it doesn't make sense to use that feature. People all assign different values to certain types of harm or damage, and also have different risks based on how they ride and what their environment is like. For some people, wearing a full-face helmet may be worth the extra expense and heat, but most people don't find it's worth that trade-off. Sadly, for many of these decisions, we don't have enough information; there isn't very much conclusive real-world data on the efficacy of bike helmets, let alone different types of bike helmets. You also have to consider that a motorcycle has no trouble accelerating to and maintaining traffic speeds. In short, a motorcycle really doesn't need to look backward with anywhere near the frequency that a cyclist does. They also have mirrors mounted on their bikes which most cyclists don't have. For example. Coming off a red light, anyone on a motorcycle can just go without consideration for anything behind them. Lane changes require major planning on a bicycle, but are relatively simple on a motorcycle traveling at matching speeds with all the cars. Due to momentum, people in bicycle collisions tend to fall forward in the direction they were moving. Therefore, they often land on their faces, which are entirely unprotected by standard bicycle helmets. I speak from experience, having just lost all of my top front teeth. My surgeon says this is incredibly common among urban bike commuters. There is no demand for full face helmets for cyclists because people are socialized to think that (1) they're overkill and (2) they look silly. I sure wish I was wearing a full-face helmet when I crashed. And no preaching about safe riding! I am a strong city rider, who errs on the side of caution when it comes to safety. Collisions do happen. My grandmother used to cycle about in a skirt when we were in Germany together. She wasn't very fast. Actually, I'd say she was about as fast as a very small hamster, or thereabouts. I don't think she was pretending to be a motorbike. But she liked it that way. In fact, she used to cycle in England too. But then again, so did all her friends. Funnily enough, she never liked to cycle in England in her later years. Precisely because in England, people expected her to behave like a motorbike. She thought helmets daft. She also resented having to dress up like a belisha beacon just because our streets feel like 'spaghetii junction' (her words not mine). I think she saw herself as, well, herself. Just an old lady on a bicycle. And, frankly, her revs weren't what they used to be. So the chances of her pedalling along at the same speed as a Ducati were fairly slim. I don't wear a full-face, whole-head helmet because I've weighed up the risks and I don't need one. I'm not a motorcyclist, I don't have to confront the same dangers a motorbike rider does. Full-head helmets for bikes are available, so where there's a demand, there is a supply. I do always wear a full face (downhill) helmet on my everyday (25 km one way) commute to the job. Being a downhill addict, it's been straightforward to put it on from home to my training sites and back. Since this was quite manageable, I skipped the half-face helmet completely even for normal cycling some three years ago. Yes, you get the looks. Feeling observed... huh? This is merely a question of carrying a large pink teddybear across a populated city square. Do it five times and this part is over. Yes, there is a certain reduction of the field of view. Place a tiny mirror on your bike frame. Hearing is not at all impeded by a downhill helmet but considerably reduced when wearing a motocross or other mc helmet, specially directional hearing. So you need to look twice! One and a half year ago one of my colleagues had a face plant and got a quite painful chin surgery, and also lost 3 teeth that had to be re-implanted. Needless to say - he's joined the club by now. When riding in traffic/city areas, your ears are almost as important as your eyes for keeping safe. And wearing a full face motorbike style helmet would severely limit your hearing. Add that to the excellent points Brian and Meagar make above about full face helmets being hot and heavy. Some cyclists do, specifically in the types of cycling that are more prone to falls, or where falling into obstacles like trees are more likely. Specifically, down-hill or BMX style helmets usually cover parts of the face. Typically, motorcycle helmets and full-face bicycling helmets are hotter and heavier, making them less well suited for exercise or strenuous activity. Conversely cycling helmets meant for on-road use are extremely light weight and usually contain a large number of holes allowing airflow to evaporate sweat and cool the wearer, while providing good protection for falls on flat pavement. So unless you have a specific need for additoinal protection, "all-encompassing motorcycle-style" helmets generally not worn. I think that it's ridiculous that bicyclists wear so little protection. I fell recently doing 20 miles an hour and broke my collarbone, damaged my shoulder and busted open my chin--all while wearing a dinky helmet. I've concluded that a 15-25 mile bicycle crash is all that it takes to do permanent damage. I began to wonder why my motorcycle friends wear more protective gear and I don't. They wear better helmets, shoulder pads, chaps, etc all to protect them from road rash and more severe injuries. Bicyclists go out half naked but travel at only slightly slower speeds that motorcyclists around urban streets. I've concluded that bicyclists are less protected because there are no role models for being more protected. Nowhere do you see Lance in a pads and a better helmet. When every cyclist that you see in print and video is shown unprotected, the rest of us poseurs become too embarrassed to wear protective garb. The message from the media and professionals is "Man Up. Ride Unprotected." All the points mentioned above are true and mostly all-encompassing. Here's my take on the point. I am a biker and motorcyclist, both. 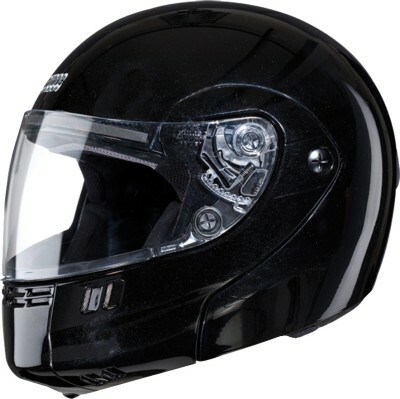 I have biker helmet and full face 1.2kg heavy motorcycling helmet, which becomes a half face helmet too when needed. On one occasion I did wear the motorcycle helmet during a leisure cycle ride in the city. I don't mind the looks other commuters gave me. Yes it did hamper the listening a little bit, but not much since I am used to wearing full face helmet on my motorcycle and yet can listen to brake and horn sounds clearly over the din of the exhaust. The only issue that I faced was - Severe neck-ache within a short span of 30 minutes which never happens during motorcycle ride. The reason for this is body posture and movement. During cycle ride, your whole body moves with every pedal movement. From head to toe. The lightweight cycle helmet does not feel like an additional weight on the neck. Also your body posture keeps on changing rapidly - from straight up at crossroads to bending over to gain speed. All this time with cycle helmet you do not have to worry weight since its barely weighs anything (as compared to motorcycle helmet). The ride with motorcycle helmet became a sore neck (literally) since every movement you do, pedalling, bending forward, is accompanied by massive continuously shifting weight on the neck. The neck-ache does not happen in motorcycle because for most of the ride, you are sitting in almost the same position. Your body movements are limited to hand and feet movement from braking, accelerating and gear changes. This does not involve whole body motion and hence once the helmet is set in for the ride, additional stress is not felt. I had a regular mountain bike half helmet for mountain biking, and never had problems... then, one day I crashed hard (due to unexpected hikers on the single track going downhill) and fell on my face: almost knocking out my front 4 teeth, and nice scrapes and bruises on my nose and chin (not cool to have on a girl). I've recovered with some scarring, but the fall made me realize that they made the full-faced helmet for a GREAT REASON. I used to think it looked heavy and ridiculous, but now I use the full-face for going downhill, and switch out to the half helmet on my climbs back up. Safety first! By the way, I bought a rockgarden full-face helmet, and it's very comfy and has lots of ventilation. Because the bicycle industry markets riding a bicycle as a sport with everything specific. Just look at what a motor vehicle does to a little Styrofoam helmet in crashes. 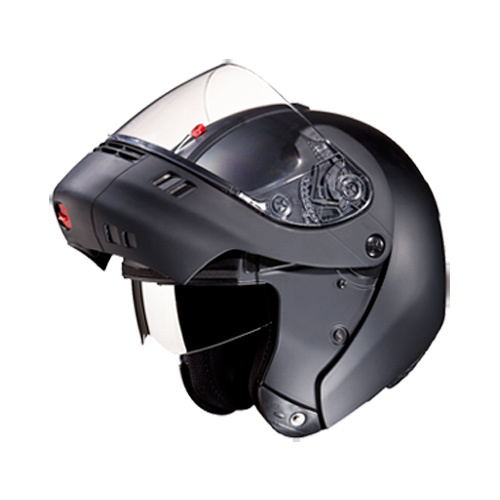 I opted for a 3/4 face motorcycle helmet that has a flip down shield and removable chin bar. Its well vented, plenty light and has an excellent field of view. If commuting among traffic than be professional and wear adequate hi-vis, protective gear. Someone didn't figure all this out already, its truly up to bicycle commuters of today to set the standards of tomorrow! One reason is that in many places the law requires motorcycle helmets to be full-face. On a bicycle in most locations helmets are not required and the choice is yours. I ride with a half-head helmet in temperatures up to 95°F and never find ventilation is an issue at all. I can't believe the extra protection of my mouth and chin would suddenly change that. I have read answers to this question and many of you think about bicycle accidents as if they were at lower speeds, instead of the higher speeds of motorized vehicles. I would agree with that, if you are assuming there are no motorcycles or cars around, when you ride. However, cycling in a city exposes you to motorcycles, cars, buses and trucks in addition to other bicycles and to rear, frontal and sideways crashes with these vehicles. Apart from bicycles, motorized vehicles have speeds exceeding 20km/h and masses far greater than both bicycle and rider. Thus, protection for city riders must be in accordance with this fact. The problem here is not velocity, but momentum and kinetic energy. Have you ever wonder why a lot of motorized vehicle accidents are fatal? They are fatal, because in this crashes there are transfers of large amounts of kinetic energy upon impact, which results in deformation --- that crushes your bones --- and throw of your body by several meters from the crash point, for example. And, of course, bicycles (and motorcycles) do not offer a lot of protection against these (in fact they suffer a lot of damage or are completely torn apart). As any city rider must be aware of his/her surroundings in order to lower risks, it is also true that he/she must be prepared for situations that are away from his/her control. Protection provided by standard bicycle helmets will not be enough, when we would be exposed to an unavoidable collision with a motorized vehicle. I prefer to suffer from bulkier and heavier helmet like those of closed motorcycle helmets. Motorcyclists use full face helmets because the 'happy biker with bugs on his teeth' experience. The speed most motorcyclists go makes that they get bugs and other things in their faces at quite high forces. As they have to wear helmets, (in most countries compulsory,) they might as well add the face protection part. At the speed they go, there is enough cooling from the air. Most cyclist go at much lower speeds, the bugs are not that much of a danger, although at every speed they can be a nuicance. The cooling factor of speed is much lower. Those cyclist that mostly wear helmets have a very awkward head position, anything that makes it harder to look up will endanger the cyclist rather than protect. On top of that, for many cyclists helmets are more precieved safety, not real life, the current helmets are enough to believe in the fairytale, nothing else is needed. I have seen enough proof to not believe in that story and would not don any helmet, even less one that fully encloses my head. One of the good things of cycling is the fresh clean air around my head, no way I will put a plastic case around it. A pair of glasses (and a shawl in front of my mouth in case of very nasty bugs) is all protection I need. Not the answer you're looking for? Browse other questions tagged safety helmets or ask your own question. Do helmets go out of style and get discontinued by manufacturers?